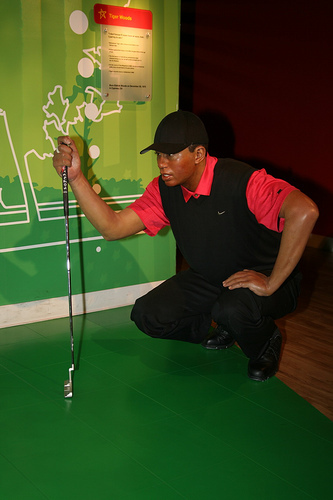 What do Tiger Woods and Taiichi Ohno, one of the chief architects of the Toyota Production System, have in common? Well – besides making history in their particular fields of excellence – both of these men believe/believed in practicing – a lot. And I personally believe that the only way to get good at anything, and I do mean anything, is to practice. As a parent I can tell you that raising kids takes a lot of practice. When we had our first child I struggled at the easiest tasks – like diaper changing. Now, four kids into this thing, I can change a diaper with two kids draped on my back as I watch my Buckeyes on TV attempt to convert a key third 3rd down. I assure you I was not born with this, um, talent. Likewise, the first time I ever attempted to draw a value stream map was, let’s say, less than a smashing success. Sure we got it done… and yes, we made things better. But when I look back on that occasion I realize I could have done much better. But, in order to improve we must take that first step. And after that another… then another… then another. Malcolm Gladwell recently wrote a book where he claimed that it takes 10,000 hours of practice to master something. Now, some will argue this fact to be bogus. And some kaizen practitioners may even attempt to prove him wrong. You know what I say? Go for it! Completely agree. It seems like especially in today’s “get-it-now” culture, people are particularly averse to taking the time or having the discipline to do what it takes to be successful at something. And boy can I relate to the “practice” it takes in being a parent! 1) Perfection is the enemy … we have in our culture a saying, “Practice makes perfect” which is NOT true. The accurate form of the saying is “Practice makes better”. The goal is improvement … NOT perfection. 2) Business is one of the only places where leaderships systematically fails to allow or encourage practice. When do you get to practice leading a meeting or RIE prior to standing up in front of the room and doing it. Crazy. You would never see any sports team at ANY level with that kind of preparation system. So … I would suggest a goal might be … create more opportunities to practice skills within our work environment and measure and celebrate improvement all along the way. How to Stretch 90 Second of Work to 2,700 Seconds	5 Why? vs. Why Not?